Macaws are such popular topics with children. These birds' bright colors and playful antics appeal to the child in all of us. 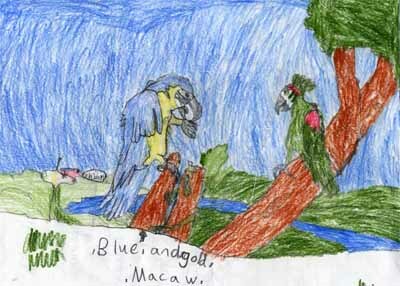 This "Blue and Gold Macaw" by John is eating something using its left foot. Macaws often eat this way, as it enables them to manipulate their food. Sometimes the nuts they eat will be easier to crack one way rather than another. There is another bird sitting on a branch to the rightit looks like a parrot. To the right, sitting on a flower, is a bug saying "Oh boy!" John says, "I wish I could come to the Amazon with you." 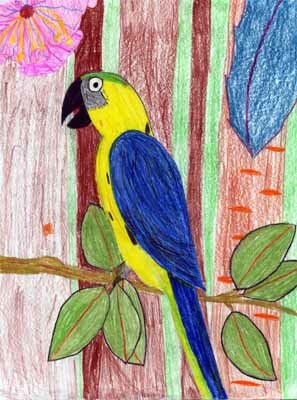 This beautiful drawing by Sarah is a blue and gold macaw sitting on a branch. Its beak is open, as though it is about to say something. Macaws can learn to mimic human speech, although some other parrots do better. Behind the macaw is a tree and a giant flower. Sarah says, "I know for sure any chance I get I'd go to the rainforest." I feel the same way!